Xerxes, one of Can Do Canines most recent graduates, will be leading a life quite different from other graduates. The Black Labrador Retriever was placed not with a person with a disability, but with the Orono Police Department. He’s a Community Service Dog, and the first in Minnesota to serve in this capacity for a police department. 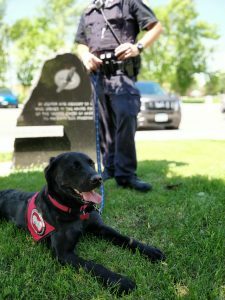 As a member of the Orono Police Department, Xerxes will have the important role of comforting and connecting with individuals impacted by trauma or experiencing a mental health crisis in the community. When individuals are experiencing fear, anxiety, or a mental health crisis, “Having a K-9 partner introduced into those situations can have a calming effect,” says Orono Police Chief Correy Farniok. The department has seen that when a uniformed officer is introduced, it tends to escalate a situation, whereas a dog can be used as a de-escalation technique. In addition, Xerxes will participate in public education demonstrations with human officers, helping to increase community engagement by being a hairy conversation starter that makes officers more approachable.